NOV Mono's solar powered submersible pumping system. The new SUN-BUDDY™ is a solar powered submersible pumping system that has been designed to combine performance, long life and minimal maintenance requirements. Managing water movement on a small rural property can be a challenging task, with water that has to be drawn from rivers, bores, tanks and stock dams for small-scale crop irrigation, stock watering, garden watering and general household use. The Mono Sun-Buddy uses advanced technology that was previously only available to large-scale agricultural operations, and offers a versatile variable flow capability which is suited to a wide range of different applications. The result of Mono’s 30 years of solar-powered pump experience, the company claims that its Sun-Buddy is a genuine, easy to install ‘plug and play’ solution. Its minimal maintenance requirements can be handled onsite, making the Sun Buddy a set-and-forget solution which delivers high-quality and cost-effective performance. Driven by solar energy, this small but efficient pump requires no diesel, grid power, wind or batteries to run. This environmentally-friendly method enables the operator to quickly recover the initial cost by eliminating all future fuel and electricity bills. Designed to operate in harsh conditions, the Sun-Buddy incorporates a robust, brushless, submersible DC motor. This delivers high torque, high efficiency performance and features thermal overload protection that ensures long life and reliable operation. A solar maximum power point tracker adjusts the voltage output of the 195 W solar array to maximize power generation and increase or decrease voltage to suit the demands being placed on the pump. 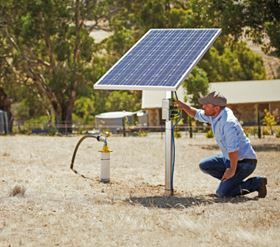 Franklin Electric has launched its solar water pumping system, the Fhoton™ SolarPAK System.